Located on the island of Cozumel, this hotel is right next to two of the island's most important coral reefs - Palancar and Santa Rosa- and the perfect place for snorkeling and diving. Divided into luxurious bungalows, the facilities are comfortable, with extensive gardens, adult swimming pools, a children’s swimming pool, sundecks with lounges and umbrellas, various bars, 4 restaurants and a snack "palapa". There are numerous sporting and entertainment options available for the entire family's enjoyment. 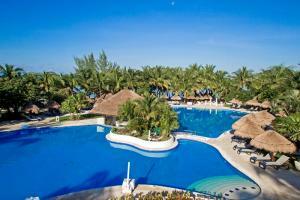 Transfer time from Cancun airport around 2 hours and approximately 20 minutes from Cozumel Airport. The hotel has two a la carte restaurants, an international buffet and a grill/snack bar. Choose from a wide variety of dining options ranging from international dishes to the succulent grilled meats and traditional Mexican cuisine such as tortilla soup and tacos.